Beltane is truly one of my favorite days of the year! On May 1, we will celebrate this sacred Celtic tradition, and bask within its vibrant energies of fire, passion, fertility, and love. 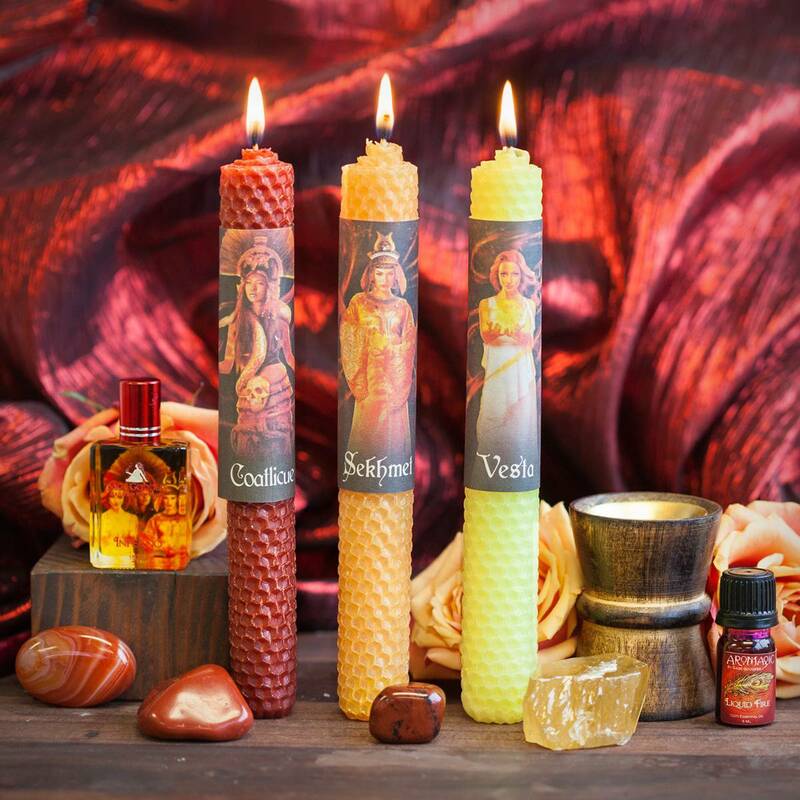 In honor of this extraordinary holiday, I’ve created this Beltane: The Goddesses of Fire Set – the tools of which will help you harness the magic of fire goddesses from traditions across the world. Work with this set to show reverence for some of my favorite Ladies of Fire: Sekhmet, the Egyptian solar deity; Vesta, the Roman virgin goddess of the hearth, home, and family; and Coatlicue, the Aztec goddess who gave birth to the moon, stars, and Huitzilopochtli – god of the sun and war. Three (3) beeswax rolled candles, one for each goddess. 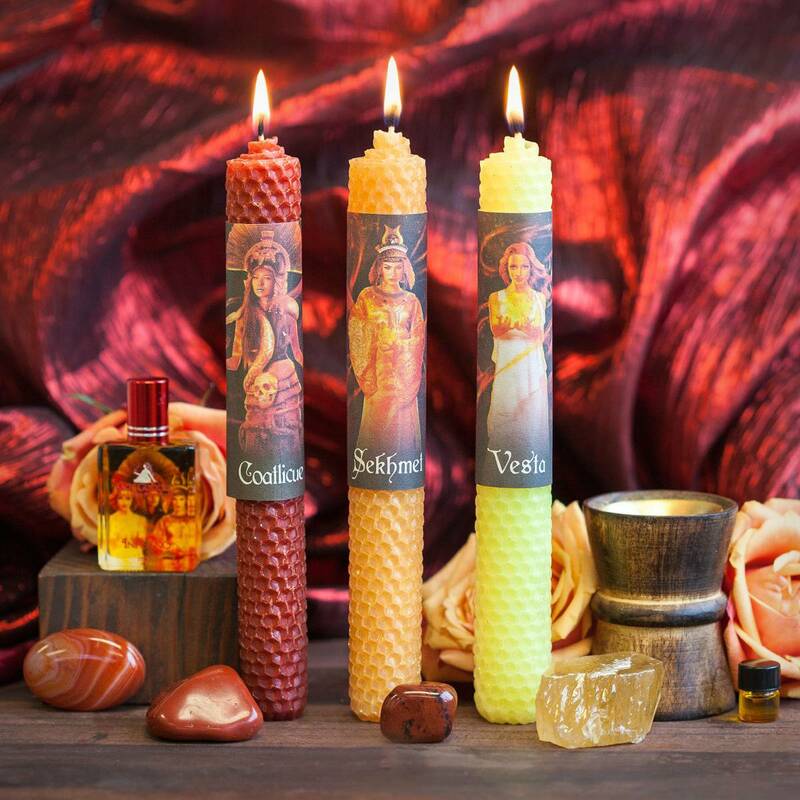 These candles were hand-rolled right here at SG Headquarters, with sheets of wax in colors that represent the unique vibrant energy of each goddess. Each candle has been infused with carnelian chip stones – the fiery stone of determination and creative power. One-third (1/3) of a dram of Liquid Fire Incense, laced with intoxicating notes of saffron, ravensara, rosemary, and cinnamon. Each dram has been infused with a carnelian chip stone, for added passion and empowerment. I recommend anointing your candles with this liquid incense, to powerfully call forth the Fire element and its qualities of passion, presence, spontaneity, and adventure. One (1) copper incense burner, which will come with two charcoal disks for you to burn your Liquid Fire Incense upon. One (1) 15 ml bottle of my Inferno Perfume. With notes of orange, rosemary, and saffron, this perfume will ignite the flames of your inner Fire Goddess! 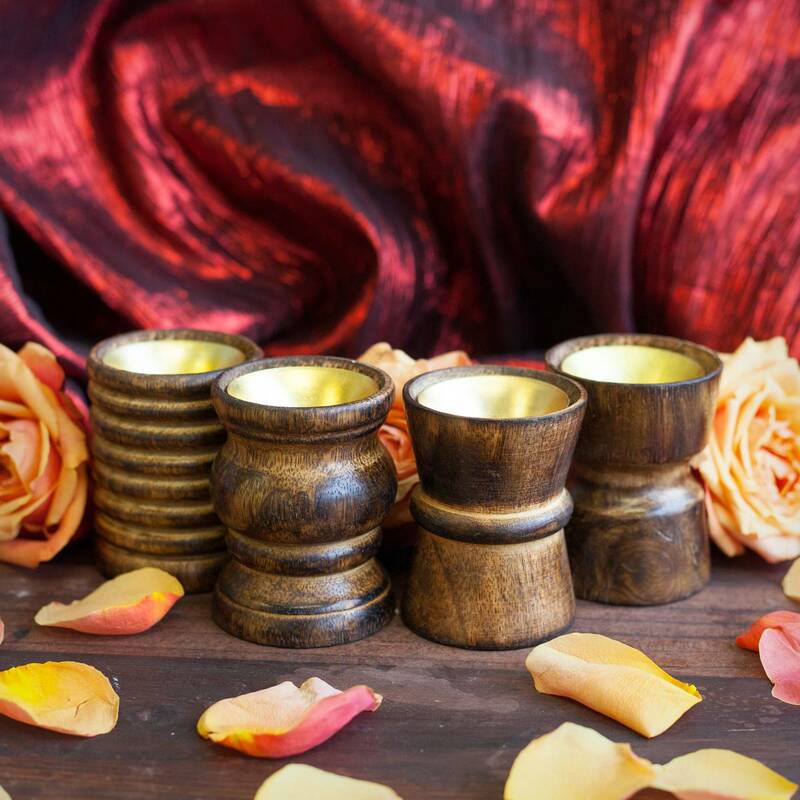 Anoint yourself with this blend to powerfully energize your spirit, and to call forth unbridled vitality, enthusiasm, and creative inspiration. Each bottle has been infused with a carnelian chip stone, for fiery gemstone magic. One (1) piece of natural honey calcite (about 2”). I chose this gemstone to represent Vesta, the Roman goddess of hearth, home, and family. Honey calcite aids in healing the “mother wound”, and in rekindling your maternal relationship. 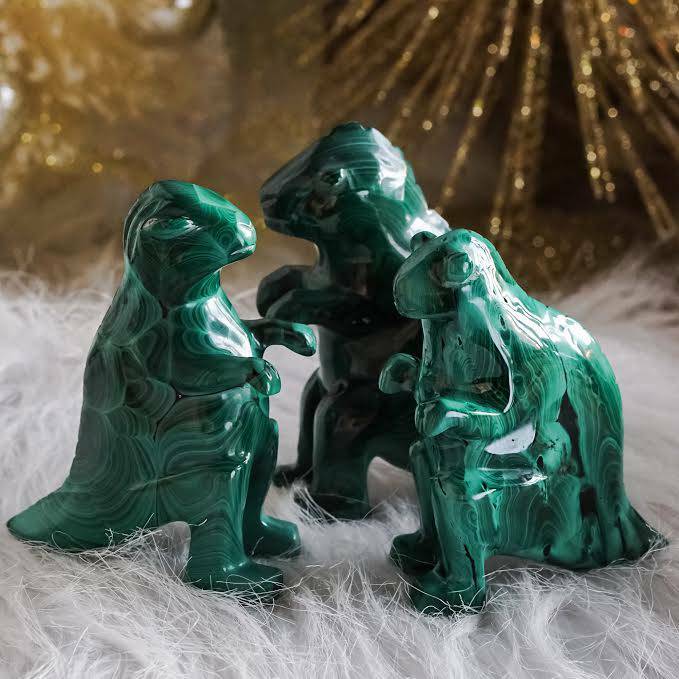 This gem connects you with the Great Mother energies of creation and procreation, and is also a powerful bringer of prosperity on all levels. One (1) piece of mahogany obsidian (about 1”). I chose this gem to represent Sekhmet, the Egyptian warrior goddess whose breath created the desert. Mahogany obsidian is a stone for the warrior – for anyone undergoing challenges or doing serious spiritual work. 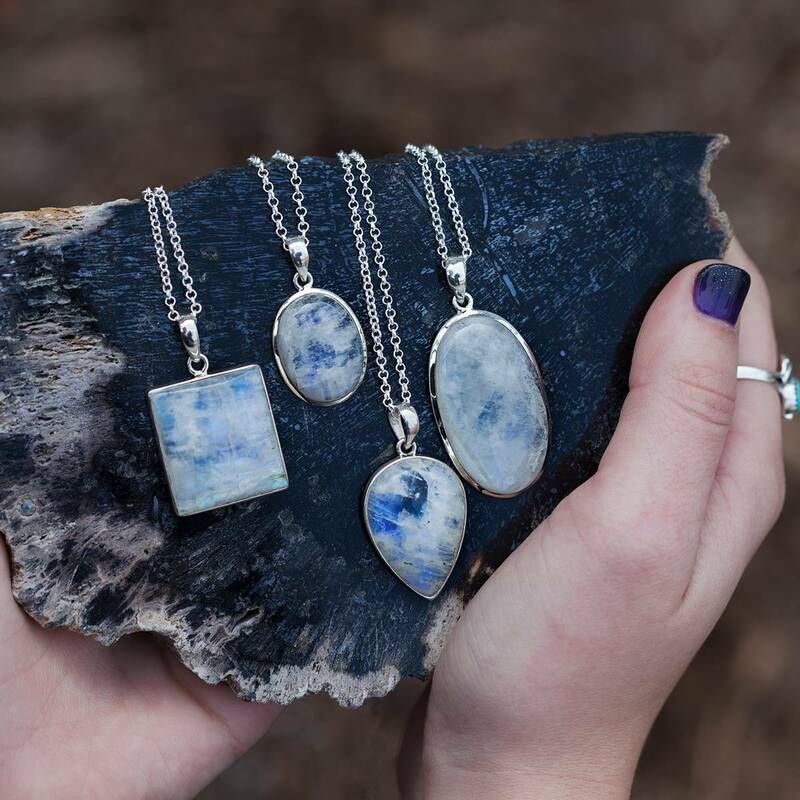 This stone will enable you to overcome life’s obstacles with strength, courage, and ease. One (1) piece of red jasper (about 1”). I chose this gem to represent Coatlicue, the Aztec goddess of life and death, childbirth, destruction, and regeneration. 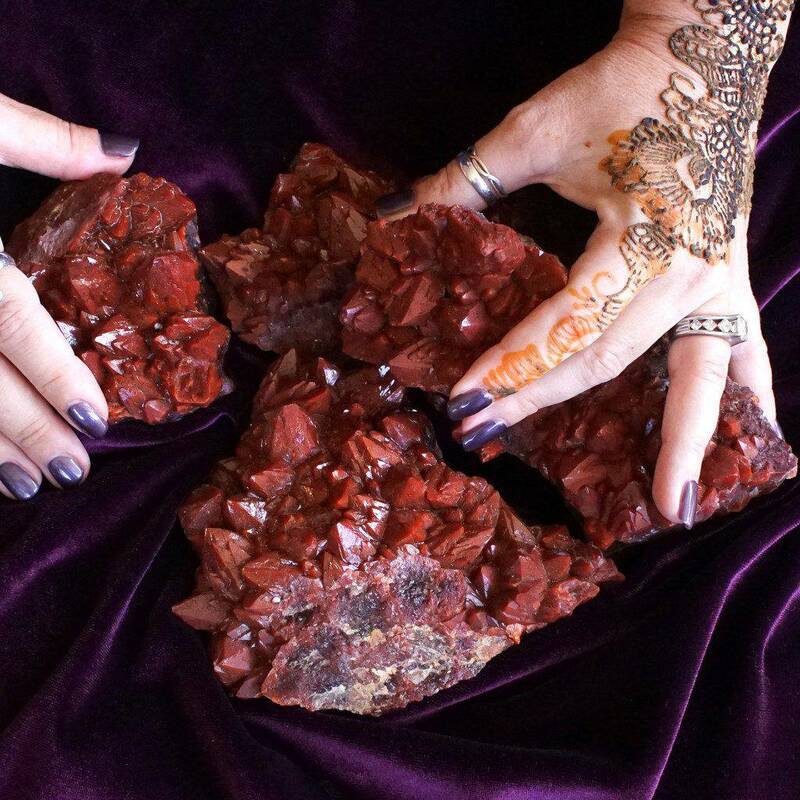 Red jasper is a stone of rebirth, renewed strength, and courage. This gem works within your physical body to connect you deeply with the earth, and is a powerful bringer of stability and emotional balance. One (1) carnelian palm stone (about 2”). This stone is a powerful Solar Plexus and Sacral Chakra activator, and brings forth energies of sexuality, creativity, confidence, and empowerment. Work with this palm stone to lift the levels of passion and sensuality in your life, and to boost sacral energy – which can manifest itself as creativity, feelings of peace, or even as weight loss! This listing is for one (1) Beltane: The Goddesses of Fire Set, as listed above. You have the option of choosing the set with 1/3 dram of Liquid Fire Incense, or with a full 5 ml bottle. Please select the offering that calls to you from the drop down menu above. Yours will arrive lovingly parceled along with a single leaf of white sage and a parchment describing the properties of the stones.